Tap a child on the shoulder while you sing the song. Once he or she has chosen a word strip, tap another child on the shoulder to go and get another word strip (even before the first child has decided what category in which to put it). Sing the song again and again while the children bring up the word strips and put them into a category. 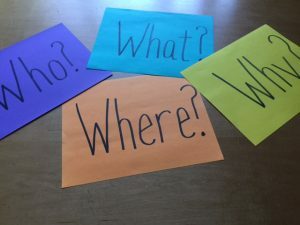 When the children are done bringing up all the word strips and categorizing them, ask the children to sing only the phrases that are under the who? and why? categories, and you will sing the rest. Now ask them to sing only the what? and where? categories and you sing the rest. This activity is a huge benefit to those children who use logic as a primary source of taking in information. It is a challenge to all older children’s emerging ability to categorize and really think about the words. Because there are many phrases, lots of children get the chance to take on the challenge. And it is fun! Thanks you again, Sharla for your wonderful ideas! Hmm.. Do you think this might work for the second or third verse? Yes, I think this would work for that! I’m doing this tomorrow with the second verse. But I’m replacing “where?” with “how?” since a place isn’t mentioned in that verse. This such a fun idea! My kiddos will love it. They thrive on challenges!!!! They fit better in the What? Category to me, but I’d love to see what your reasoning for putting them in the Why? Category. My reasoning was that they answer the questions… Why wouldn’t Laman and Lemuel go back? Why did Nephi go? Thanks for asking! I would say… Why did Nephi “Go and “Do”? Because he was courageous and because Laman and Lemuel were both afraid to try. I agree that it’s tricky because all the questions could be worded differently but that’s my take on it. So easy to do and so effective for teaching! Thank you!!! I was feeling so burnt out trying to make crazy things or come up with big activities all the time. When I discovered your blog and watched your training it completely changed primary for me! The children sing even more and learn the words better, the prep is easier, and my lessons feel so much more fun and effective! Thank you so much for all you do! Your ideas are so useful and interesting and fun. And they bring the spirit. Thank you! I love this! We have a combined primary so I’ll be either adding pictures around the room either with colors attached to them or mounted on colored paper and have the jr primary pick the pictures and place them under the corresponding color. Does that make sense? Or I may pick a “team”, one jr to pick the phrase and a sr to help place it under the correct question. Thank you so much! I love this and I am going to use this today. I just wanted to point out the correct lyric is “thing the Lord commands” (no s). Very common mistake! Great idea, thanks for your hard work! I love this idea! Just one thing I noticed since I became a chorister: the chorus actually says “I will go, I will do, the THING the Lord commands”, not “the THINGS the Lord commands”, on all three verses. I have been singing it wrong this whole time. Sharla, you have so many amazing videos and examples. I’m curious how a pianist fits into your singing time. Do you just have them watch you and let them decide when to jump in with the piano? Sharla! Thank you so much for all of your help, for all of your ideas. I love your book, and I learned so much at your workshop! I am really enjoying my calling. Thank you, thank you for all that you do. I wondered, how do you transition into singing for the program? I’m not sure how to take my children from having wonderful singing time experiences to making sure that they are actually able to then sing the songs (for the program!). I was planning on continuing on doing singing times in the structure that you outline in your book, just rotating all of the program songs each week. But now I am feeling a little apprehensive about that. Should I plan a few weeks where we go through all of the songs without the learning activities? What do you recommend? I would love to reassure you about the program. If your children are enjoying singing time, they will probably sing well in the program. It might help your confidence, though, if you take each of the songs and sing them for the opening song without any activity so that you can see how well they know that song. That is also the place for you to practice your “conducting encouragement.” By that I mean the body language you give the children as they sing to encourage them to sing out, to breath well, and to go for it as they sing. You don’t have to stay within a conducting pattern, but you do have to lead them so they are singing together, breathing together, and getting louder or softer as needed. Does that make sense? Thank you, thank you Sharla! I really appreciate the time you take to listen and to respond. I feel at peace with continuing to provide the thoughtfully engaging singing times that your methods produce, rotating all of the program songs as we get closer. And, yes! Good idea with the opening song…more so for me then for the sweet primary children. Remembering that conducting doesn’t just have to be the pattern has just opened a lot of doors for me. Thank you! Sharla, I cannot tell you how much you have changed Primary music for me, and the Primaries in our stake. I am continually amazed at the ideas and inspirations. Many, many thanks. I am new to this blog. I am really loving all the ideas and have watched all the videos you have shared as well as others. Is your book still available? Yes, you can order it here on this blog, or from the website Toteachachildasong.com. Thanks for asking! From the comments here, it sounds like the book is designed specifically for teaching primary music. I am very interested in this book and wondered if there is a description of the content or if you can tell me more about it since all I am reading here is that it is truly awesome and inspiring and unique!!! I was forwarded to this blog from purposefulprimary.com last night and since reading her posts and yours I am rethinking my strategy for tomorrow where I was going to review all 7 of the program songs we have learned thus far, but it sounds like I need to choose only 3 songs a week to review and do one of the activities for each 3 songs that you have shared on this blog. Is that best? Just curious how many songs you advise to sing during music time each week. I also wondered how I can see past posts. It only shows recent posts here and not sure how to look at earlier than May posts where you share January through April songs. From what I know about the brain, choosing 3 songs to review per week would give you the most power for the brain’s ability to review and cement, especially if the activities to review those songs were varied in challenge and rhythmic body involvement. Yes, the book, To Teach a Child a Song, is aimed at teaching Primary music. It speaks of how to channel the energy of a child’s body to best learn, how to make the method of teaching and the message of the song support each other, how to insure the activity is age appropriate (think 3 year old versus 8 year old), how to set boundaries in your Primary so that every one is best served, how to provide a change of pace within the music time, what is home base and why it is so important, reaching a child through the multiple intelligences approach, how to best pace a lesson with ebb and flow, and different activities to achieve all of that. I list about 80 different activities that can help teach a song. I think if you search for particular songs, you can see past posts. Wow! That’s a lot to take in. I am so excited to learn more. I am intrigued by your comments, “how to set boundaries in your primary so that everyone is best served.” Is that a chapter in the book and how do you suggest to use this book? Do I read it first all the way through or practice ideas as I go along. Not sure how many pages in the book but curious if there is a section in the book that helps us learn how to incorporate into music time….a big change in style to take in. I have the printed book, it has about 230 pages. I’m still making my way through the book, but I have definitely been able to practice using the principles in it without having read the entire book all the way through. I’ve found that as I practice, it flows more naturally and just feels right. Chapter 3 is all about setting boundaries. I hope this helps. For me, Sister Dance’s book and website have been an answer to prayer and teaching in this way has been a blessing to the children and to me. I have a question for anyone here or Sharla. When all the strips are placed would you need to stop and discuss and see if in right place because I know they won’t have them all in the right place. That will take time away from singing if we have to evaluate. Just wondering if I assist if something is in a wrong place do I hold it out while still singing along or what do you think?